Both the E-1 / E-2 visas are designed for a national of a country which has a commercial treaty in existence with the U.S. Individuals with nationality of the treaty country shall possess at least fifty (50)% of the ownership of the company. If you would like to consult the list of the treaty countries with the U.S., please click "here". The E visas are also available to employees of a company as long as they are managers, executives or specialized workers. The E visas are issued for up to five (5) years but can be renewed indefinitely as long as the qualifying investment continues. The E-1 Treaty Visa is designed for individuals who come to the U.S. so as to carry on substantial trade. 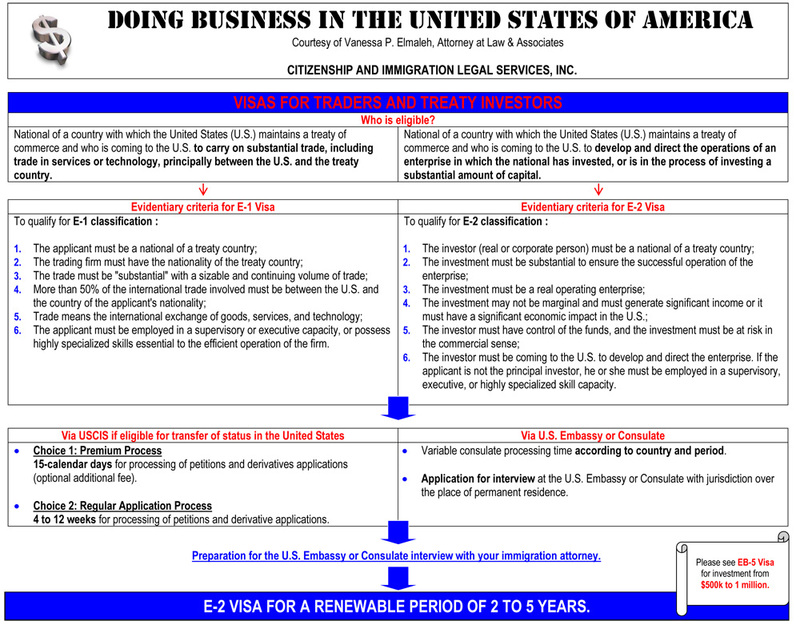 What requirements are needed to apply for the E-1 Treaty Trader Visa? - More than fifty (50)% of the trade activity must be carried on between the U.S. and the treaty country. - The E-1 Visa holder may be an independent trader, agent, or an employee of a trading company. - The trade may involve the exchange, purchase or sale of products, services or technology. The E-2 visa is for individuals entering the U.S. to direct and develop a U.S. company in which they have invested or are in the process of investing a substantial amount of capital. 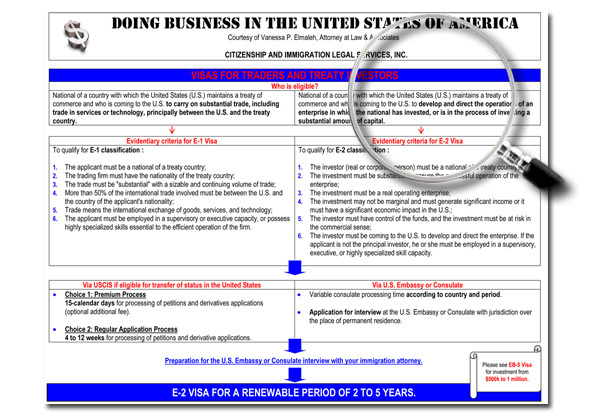 What requirements are needed to apply for an E-2 Visa? 1. The Investment Must be Active. This means that an investment in land, for example, would not qualify since it would be considered a passive investment. It is acceptable to use an escrow account to protect the investor in the event the visa is denied; however, the investor must present other evidence showing the investment will be active. In addition, the investor cannot just invest the capital and not take part in the actual managing or directing of the U.S. company. The investor must manage the business and must exercise controlling interest in the business. 2. The Investment Must Be Substantial. Both USCIS (U.S. Citizenship and Immigration Services) and DOL (Department Of Labor) regulations require that the amount invested either be proportional to the total value of the business or be enough to establish a viable business in the particular field. 3. The Investment Cannot be Marginal. The investment must generate more than just enough income for the owner to make a living and must eventually be able to generate jobs in the U.S.
To apply for an E-2 visa, an application must be submitted to the home country consulate. It is possible to apply for an E-2 visa through USCIS (U.S Citizenship and Immigration Services) only if the investor is in the U.S. and is eligible to change status to E-2. However, a first time E-2 visa applicant will have to make an entirely new E-2 application to a U.S. consulate for an E-2 visa upon their first trip abroad, despite the fact that USCIS (U.S Citizenship and Immigration Services) already approved their E-2 status in the U.S. Therefore, to avoid having to submit two E-2 visa applications, it is often preferable to apply for an E-2 visa the first time at the U.S. consulate. The E-3 visa allows Australian nationals to reside and work in a specialty occupation (same definition as for an H-1B visa) in the U.S. as well as their dependents (spouse and children under twenty-one (21)). Spouses and children of E visa holders are eligible for E dependent visas. Spouses of E visa holders may apply for employment authorization once they are admitted to the U.S. in E status. Finally, there are no restrictions on family members pursuing studies while in E status.